Matali is the charioteer of Indra and the story of Matali is found in the Vamana Purana. The birth of Matali is very interesting. It happened when the Devas (demigods) and Asuras (demons) were involved in a war. Indra, the king of Devas, was defeated and his weapon Vajra was broken by the demon king Andhaka. Indra then, on advice of Vishnu, took the help of Agni who provided him with a fiery weapon. Indra advanced towards the demons on his golden chariot provided by the Vasus. But Indra did not have an efficient charioteer who knew warfare and how to dodge through the enemy army. Indra himself drew the chariot and swiftness of it caused earth to shiver. During this period, Sage Samika and his wife Tapasvini had a child. A Rishi had told Tapasvini that if her first child was placed on open ground during earthquake it will become two. Tapasvini desired for the second child and therefore Sage Samika placed the child on open earth when Indra was riding across the skies. As soon as the child was placed on the ground an exact replica of the first child was born. But the second child, as soon as it was born rose up and moved towards Indra for driving his chariot. Gandharvas who witnessed this event blessed the child with mastery over driving the chariot. 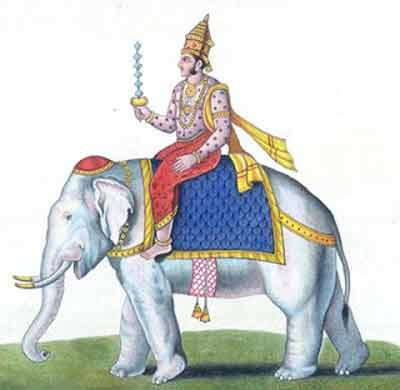 Indra then accepted the child as his charioteer and named him Matali.